SUBHEAD: One year is left of world's carbon budget until planet heats up 1.5º over pre-industrial temperatures. Image above: As the planet warms, more extreme conditions are imminent. 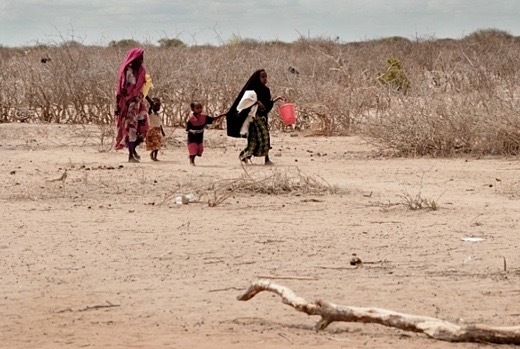 As a result a series of enduring droughts in East Africa has already caused widespread deaths, malnutrition, and fueled the migration of refugees to Europe. Photo From original article and (https://www.flickr.com/photos/savethechildrenusa/5912004723/). Our window of time to act on climate may be shrinking even faster than previously thought. We may only have one year remaining before we lock in 1.5ºC of warming—the ideal goal outlined in the Paris climate agreement—after which we'll see catastrophic and irreversible climate shifts, many experts have warned. That's under the most pessimistic calculations. According to the most optimistic prediction, we have four years to kick our carbon habit and avert 1.5º of warming. And to limit warming to 2ºC—the limit agreed upon in the Paris climate accord—we have nine years to act under the most pessimistic scenario, and 23 years to act under the most optimistic. "So far, there is no track record for reducing emissions globally," explained Fabian Löhe, spokesperson for MCC, in an email to Common Dreams. "Instead, greenhouse gas emissions have been rising at a faster pace during the last decade than previously—despite growing awareness and political action across the globe. Once we have exhausted the carbon budget, every ton of CO2 that is released by cars, buildings, or industrial plants would need to be compensated for during the 21st century by removing the CO2 from the atmosphere again. Generating such 'negative emissions' is even more challenging and we do not know today at which scale we might be able to do that." Climate activists and environmentalists have also long warned of the potential negative consequences of geoengineering and other carbon capture schemes, as Common Dreams has reported. "Hence, the clock shows that time is running out: it is not enough to act sometime in the future, but it is necessary to implement more ambitious climate policies already in the very short-term," Löhe added. "Take all of the most difficult features of individual pathways to 2ºC—like fast and ambitious climate action in all countries of the world, the full availability of all required emissions reduction and carbon removal technologies, as well as aggressive energy demand reductions across the globe—the feasibility of which were so heatedly debated prior to Paris," Löhe said. "This gives you an idea of the challenge associated with the more ambitious 1.5°C goal." That's according to the ticking carbon budget clock created by the Mercator Research Institute on Global Commons and Climate Change (MCC). The clock's countdown now shows that only one year is left in the world's carbon budget before the planet heats up more than 1.5º over pre-industrial temperatures.